A small pair of Claddagh earrings cast in sterling silver. These beautiful Claddagh earrings are small in size and are perfect if you love a dainty style of stud. The heart of the Claddagh features an emerald green cubic zirconia stone. The perfect gift for you or someone you love. 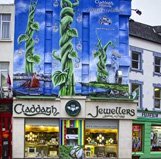 Claddagh Jewellers -The Celtic Jewellery Specialists - From Galway with Love!